Japanese Billionaire Books First Moonshot Aboard SpaceX's 'Big Falcon Rocket' Yusaku Maezawa would be the first person since 1972 to travel around the moon and the first-ever private citizen to do it. He was introduced at SpaceX headquarters near Los Angeles Monday night. 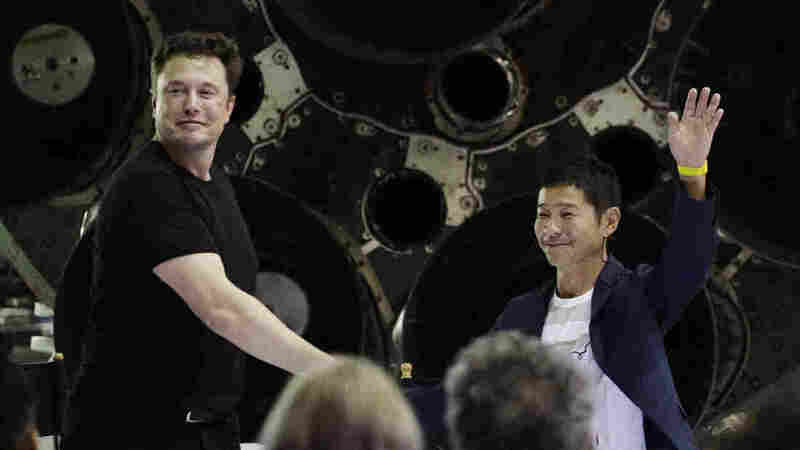 SpaceX founder and chief executive Elon Musk, left, shakes hands with Japanese billionaire Yusaku Maezawa, right, on Monday, after announcing that he will be the first private passenger on a trip around the moon. Forbes ranks Maezawa as the 18th richest person in Japan. While he might not be a household name in the West, he is famous in his own country as the founder of the Amazon-like shopping portal Zozotown, Japan's largest online retailer. He is best known elsewhere for paying a record $110 million last year for a 1982 painting by the late Jean-Michel Basquiat. Maezawa says he is not planning to make the lunar voyage alone, but will invite up to eight artists to journey with him. He wants his guests "to see the moon up close, and the Earth in full view, and create work to reflect their experience," he says. The price tag for Maezawa's ticket isn't clear and SpaceX did not make that information public. However, Musk did say that Maezawa brought the idea to him and that the Japanese billionaire's money will help fund development of Big Falcon Rocket, or BFR, which the company plans to use for the lunar flight — and eventually, for a flight to Mars. The BFR is a long way from reality and Musk himself says he's "not 100 percent certain we can bring this to flight." He says the rocket will have to be tested many times before a human passengers are launched. Musk says he's aiming for Maezawa's moonshot to take place in 2023.